The Institute of Food Technologists (IFT) is a hub for capturing and sharing insights related to the food and beverage industry. This year’s annual meeting and food expo, June 24-28 in Las Vegas, Nevada, was no different as suppliers exhibited to share new ingredients, solutions and offerings for global consumer packaged goods customers. To summarize the trends at the event, IFT17 was the year of simplicity, adventurous flavors and value-added foods. Five noteworthy trends surfaced as attendees walked the floor at IFT17 and attended sessions, all of which are supported by recent Mintel research. Taste is one of the most important qualities. Health and wellness concerns are transforming the industry, making IFT a popular place to swap clean label ideas. However, according to Mintel, taste (83%), freshness (76%), cost (72%), healthfulness (63%) and natural (50%) are the top five purchasing drivers. Meaning, consumers want healthier alternatives but refuse to sacrifice taste. 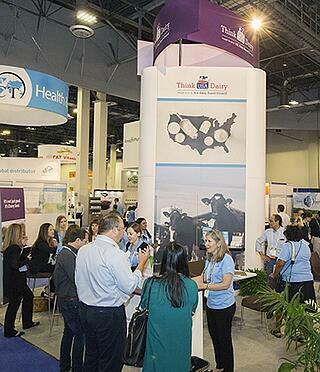 At the show, we reminded our booth visitors that S. dairy ingredients have a pleasant taste that consumers enjoy. They tend to complement flavors so formulations can offer enjoyable nutrition. As seen in this Udon noodle soup, a tasteful global cuisine is achieved with a reduced sodium broth and high protein noodle. The market is crowded with too many choices. Consumers are inundated with food and beverage offerings. To standout in this saturated market, innovation is not enough. Mintel explained that new varieties, packaging and products accounted for almost 100% of U.S. food and beverage product introductions from 2007 to 2016. Because consumers rely on recognition to make decisions easier, many new products are a reintroduction of the old, reinvented to fit into modern lifestyles and packaging trends. For example, the Switchel, like the one we featured at our booth, is a traditional beverage making a comeback with younger audiences for its health benefits. High-stress lifestyles are raising concerns. The need for added value was apparent as booths featured consumer-desired health benefits, such as sugar and salt reduction, protein, weight management and relaxation. According to Mintel, 88% of Canadian adults say relaxation is important for a healthy lifestyle; 33% of employed UK adults eat comfort food to handle work stress; 22% of Brazilian adults want products that help them relax during their free time; and 54% of U.S. adults who struggle with sleep, almost two-thirds, use or want beverages exuding relaxation elements that may help with sleep. The appeal of natural colors and flavors. Natural flavors that allow for visually appealing products and vibrant colors attract consumers for their eye-catching and photo-worthy qualities. The search is on for ways to naturally brighten foods and beverage. For example, the number of innovations with matcha increased by 30% globally in 2016 and has grown 246% since 2012, based on Mintel research. For an idea on how to use trendy flavors, our matcha dairy bar offers 15 grams of high-quality protein per serving while providing a mini on-the-go breakfast or snack. Clean label is here to stay. Consumers demand total transparency, making clean label a standard across the industry. With brands opening up about the ingredients in their products, the origin of those ingredients and how they are processed, responsible practices and simple processes are more important than ever. For the U.S. dairy industry, milk and the ingredients derived from it are responsibly produced, nutritious, familiar, simple, tasteful and versatile, making it the complete package. Market space will continue to minimize as more innovations and renovations are developed every year. To keep a pulse on new and upcoming product launches, dairy news, food and beverage insights, and industry events, sign up to received our blog posts sent to your inbox once every week. If you are already registered, share with a colleague!